The first flavor to hit the palate is soy sauce, in a lighter, more watered down taste. I can also pick faint bits of sweet, and touches of garlic and onion. The chewing brings much of the same flavors with the exception of a bit more defined soy sauce. As for being advertised as "Teriyaki", it's not quite up to our standards. While I do taste a defined soy sauce, I'm not getting much of any sweetness, and none of the fermented character, nor the ginger. It's pretty much a soy sauce flavored jerky, and not really in the Japanese-style of teriyaki. Otherwise, the flavors that define this jerky is just that, soy sauce, in a lighter, watered-down taste. Aside from touches of garlic and onion, there isn't much else to taste. It's a mild tasting jerky in that I pick no heat, though the medium-high level of saltiness makes me want to reach for a glass of water. This jerky is more soft than the Original we reviewed earlier. It's not chewy at all, but rather dry. It breaks down very easily, and feels somewhat crumbly, and eventually takes on the texture of dry roast beef. It's still very meaty, however, with only light bits of fat and nothing unchewable. 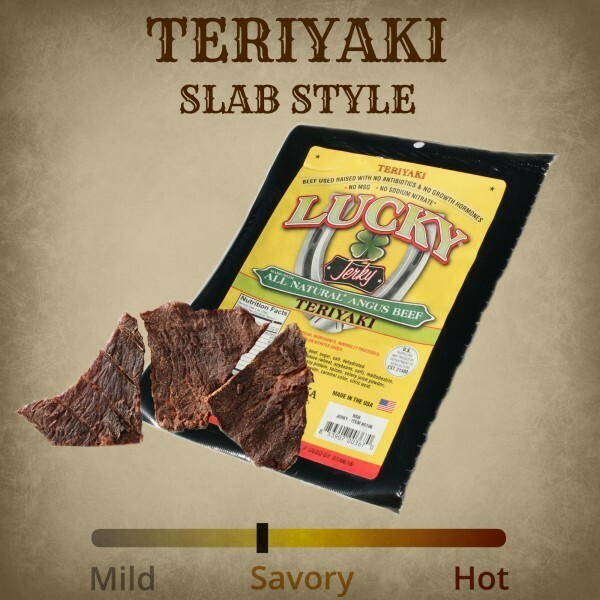 Verdict: This Teriyaki variety of Lucky Brand Jerky doesn't taste like teriyaki, at least not the thick sweet variety you expect to get from a Japanese restaurant. Instead it's more one-dimensional with mostly soy sauce to taste. It also doesn't have the meaty, chewy texture of the company's Original variety, and is soft, but dry. I didn't find it all that snackable.